Real Estate transactions can create anxiety and be confusing since it is such a large investment and requires feeling comfortable with so many variables. On Demand Realty is here to help you navigate through these issues so the experience is comfortable, enjoyable and at your comfort level. WHY SHOULD I REGISTER ON YOUR SITE? Our #1 Goal is to assist you in the search for your new home, or in the sale of your current home. To achieve that goal we need to know who you are, your goals, timelines, budgets, NEEDS and WANTS. so that we can communicate with you to achieve your plans, we need to communicate with you so we can work as a TEAM. Also, once you register on the site you will automatically be enrolled in our Daily Email program where you will get updates of all new listings and price changes as they occur in the local MLS database. This will keep you up to date on all listings so you can act FASTand not have to search each day for the latest listings. ONCE I SIGN UP, THEN WHAT? You will receive a Welcome email from us and your first search will be saved. This will then generate daily email updates for new listings and price changes. We will also reach out to speak with or meet with you to understand your goals, timelines, budgets, etc., to refine your site search for future updates, provide guidance on lenders, etc. Click Here for an online questionnaire to give us more information on your Needs/Wants. We respect your time and privacy and that you came to the site to see properties, not be SOLD! As professionals, we understand that finding the right home is a process where you need to feel comfortable and not treated a quick sale!. Our role is to guide and help you realize YOUR goals in the time you are targeting. We are NOT going to pressure you to make a decision, but we will ask for your loyalty during the process. If we are providing you tools and service that are helpful, then we hope you will give us the chance to be part of your team all the way to closing. If we are not meeting your needs, then we want to hear it so we can make adjustments to serve you better. Mutual respect is appreciated. Again, this is YOUR decision, and we want to be part of your team, but YOU, as the customer, are the leader! WHAT ABOUT ATTENDING OPEN HOUSES? Yes, attend Open Houses. It is very valuable to take time to visit homes in the areas where you are considering living. Not only will you get a chance to see the homes, but also get a better feel for the neighborhood, maybe see or meet some of the neighbors, see the traffic in the area, listen for sounds such a a highway, waves, etc, and even take a walk to get an idea about shopping, schools, churches, etc. At the same time, if you are working with On Demand Realty agent, make sure to tell the open house hosting agent so they know they can follow-up with your On Demand Realty agent. This will save YOU from handling all their inquiries. Also, let your On Demand Realty agent know which homes were of interest and why and which were not as it will help them better understand what you like and dislike in a home. WHAT IS A BUYER'S AGENT? AN AGENT DISCLOSURE? A Buyer's Agent represents the buyer's interest and has a fiduciary duty to find the best house for the least money at the terms most favorable to his or her principal (the buyer). This relationship MUST be disclosed to the Buyer and the Buyer must acknowledge this in writing before any transactions are initiated. At the same time, when an offer is made to the Seller's Agent, this disclosure must accompany the offer so that the Seller is fully of the agency relationship. WHO PAYS THE SALES COMMISSION? The seller of the home pays the sales commission to the listing broker out of the proceeds of the sale in most typical transactions. The listing broker then works with the buyers broker to share the commission based upon an agreement among the brokers. This is all handled at the close of escrow. There may be transactions where the Buyer agrees to compensate the Broker to find a home and the seller is not willing to pay a commission. This type of transaction needs to be mutually agreed upon by both the Broker and the Buyer and is typically covered in an Exclusive Buyer Agency Agreement. DO ALL LISTING AGENTS CHARGE THE SAME COMMISSION RATE? Real estate agent commissions are negotiable so there is not a set market rate. To do so would be illegal. Instead, all real estate agents should be open on their commissions and be completely transparent and up front when working with you. They should explain their marketing, communication, and support plan to you as well as the tools that will be used to market your home. If they do not, then find another agent that makes you feel comfortable. Also, remember the old addage, "You get what you pay for" applies to real estate as well. REALTOR's are professionals and earn their income assisting and guiding clients through the Selling and Buying process. Of course we feel that On Demand Realty agents are the BEST, so give us a try whether you are Buying or Selling. WHAT PAPERWORK DO I NEED TO APPLY FOR A HOME LOAN? When you are ready to look for a loan you will need to apply to a lender. All lenders will need supporting documents that show your "financial health" - how much do you earn, how much do you owe, what is your credit history, etc. To help you get prepared for this process, we have created a checklist of the basic information you will need to collect and have ready to present with your loan application. Click here for a 1 page document, "What Paperwork Do I Need to Apply For a Loan?". You can print this out and use it to check off what you have found, and what you need to find. Place the statements and paperwork in a file folder so it will be all in one place and once complete, scan it to your computer or a shared secure storage drive (Evernote, DropBox, Google Drive, etc) so you can then easily share the information or send the files when needed. Update the file monthly when new statements arrive and annually when you have your new Tax Returns and W-2's. This will have you always prepared! Being Pre-Approved is more powerful than being Pre-Qualified. See below. Getting Pre-Qualified is a rather simple process and the initial step in the mortgage process. A bank or lender will request an overall view of your financial position including debt, income and assets. With this high level information they will perform an evaluation using the lending ratios of their company and provide you an idea on the amount of home you can “qualify” for in the market. This will give you an idea on the price range of homes you may want to view. Getting Pre-Approved is more strenuous. You will need to complete a mortgage application, sometimes pay a fee, and provide physical documentation (proof) on your income, debts, and assets. The lender will check your credit rating, verify employments, debts, etc. Based on this, the lender can give you an approval for a specific amount of mortgage to help you find the right home for your budget. IF I HAD A FORECLOSURE/SHORT SALE/BANKRUPTCY HOW LONG DO I NEED TO WAIT TO QUALIFY FOR A LOAN? You should check with your lender for their qualifications as to when the "start date" begins for the waiting period, but it is usually when the lender takes ownership of the property, not when the lender sells the property after foreclosure. Any borrower that has experienced one of these circumstances will need to fully disclose this to their agent and provide an explanation to the new lender as to why it happened and why it will not happen again. See the matrix below for timelines, courtesy of third party lender, not endorsed or validated by On Demand Realty. Mortgage options are primarily based on your financial situation and may also include things such as your military service, etc. To get an answer on the best options, rates and your personal qualifications, it is recommended that you meet with a mortgage broker, lender, or bank to discuss these options. Once you have this covered and know what you qualify for in buying a home, then is the time to engage an agent to search for homes that will meet your financial qualifications. There are also Grant Programs to help you with the Down Payment and Closing costs. Click Here to learn more about the Golden State Finance Authority program. FHA stands for the Federal Housing Administration which was created in 1934 to provide mortgage insurance on loans made by FHA-approved lending institutions. FHA insures these mortgages for the approved lenders on single family. multi-family and manufactured homes. The effect of this was to create some standardization in the lending market, insure the lenders against loss if they complied with the standards and therefore produced a stabilizing effect on the housing market. Click here to an FHA Reference Guide. A "Conventional Loan" is a loan made by lenders that does not have any governmental guarantees (FHA insured or VA guaranteed). Typically these loans require a larger down payment and and higher credit score. WHAT IS A "VA LOAN"
A "VA Loan" is a Veterans Administration (VA) home loan benefit provided by private lenders, such as banks and mortgage companies. VA guarantees a portion of the loan, enabling the lender to provide you with more favorable terms. The loan requirements, including limits by county can be reviewed here, VA Home Loans. Be Aware of the VA Loan Funding Fee when you check out the VA Home Loans link. Also be aware that a veteran can use a VA Loan Benefit more than once, but not at the same time. VA Loans will NOT pay for: Condominium Certification Fee, any Pest Inspections of Repairs, Home Warranty coverage. These are known as "non-allowables" from the lenders perspective. These will need to be agreed to be covered by the seller or others, at escrow but not by the Buyer. Click here to learn more about the Cal-Vet program. A Reverse Mortgage uses the equity you have in your home to pay for the mortgage. These are special types of mortgages and as a homeowner you should consult with an attorney and your tax consultant to make sure these are the right solution for you, your spouse and your heirs. Follow this link, Reverse Mortgages, to a website by the Federal Trade Commission for more information. CAN I BUY A HOME USING A REVERSE MORTGAGE? The short answer is Yes, it is possible, but the process is a bit longer and more complicated than a conventional purchase loan. Since the equity is being used to fund the reverse mortgage, the down payment will need to be about 50% and there is a financial analysis required of the buyer regarding income, expenses and credit history. These are FHA loans so will need to follow guidelines. Click here for more information from a lender, AAG, website. HOW CAN I FIND OUT IF A CONDO IS FHA/HUD CERTIFIED? Users can search for FHA-approved condominium projects by location, name, or status by clicking here for the HUD Portal. The search can be configured to find specific types of projects through the use of the pull-down menus and entry fields. These properties are not for sale by the FHA. HOW DO I FIND VA CERTIFIED CONDO'S WHERE I CAN USE MY VA BENEFITS? The Veterans Administration has Certified certain condominiums to make sure that their Home Owner Association terms and conditions meet the VA Benefits Program. To find a list of Certified Condo's, click here VA Certified Condo Portal and enter the City and State for a list, then click on the condo on the list to see if there are any restrictions. WHAT HAPPENS IF THE CONDO IS "IN LITIGATION"? This means that the Homeowners Association has an issue with the developer and has started a legal dispute seeking remedies for their concerns. Since this is a legal action among two parties: the HOA and the Developer, the lender will feel there may be increased risk for them to loan against the property when they do not know how the dispute will be settled, who will be responsible and what damages may be assessed on either party. The result is that many lenders will not want to lend on this scenario but if you do find a lender their requirements will be more strict, such as they require a higher interest rate, may take longer to close, may offer fewer term options and require larger amounts down among other requirements. The impact to the Buyer is that you should find a lender that will lend in this scenario before making an offer. The impact to the Seller is that the Buyers will have to qualify with a limited number of lenders so the number of available Buyers will be reduced. WHAT ARE "QUALIFYING RATIO'S" AND LOAN LIMITS? There are two different ratios which may be used by lenders to determine the credit worthiness of a borrower. There are also Maximum Loan limits and Minimum FICO scores used to determine the credit worthiness of a borrower. It is recommended that all buyers seek a qualified lender to discuss their financial circumstances prior to looking for a home so that the buyer is able to fulfill their offers and a seller will know that buyer is qualified to make the purchase. The ratios, limits and scores mentioned below are advisory only and not deemed to be accurate so all buyers need to check with a lender for most current information. HOW WILL HOA FEES IMPACT MY MORTGAGE QUALIFICATION LIMITS? HOA (Homeowner Association) fees are assessed by the HOA to cover the maintenance, insurance and in some cases, utilities for the complex. These fees are paid monthly to the HOA and are a liability to the buyer, meaning if not paid, the HOA can seek judgments and attempt to foreclose on the borrower. For this reason, lenders will take the HOA fees into consideration when determining your financial qualifications. The "rule of thumb" is that for every $100 of HOA fees there will be a reduction of $10,000 - $15,000 in the allowable mortgage amount. For instance, if you were pre-approved for a $400,000 mortgage and are interested in a a home (single family or Condo) with a $400 HOA fee, you would have to adjust your qualification amount down by about $40,000 to $60,000, meaning the mortgage value would be $340,000 to $360,000 instead of the $400,000. You will need funds to place as a down payment on the mortgage. These funds help to show the lender "good faith" and the borrower has a vested interest and investment in the property. The down payment minimums vary by loan types but in general a VA loan requires $0 down payment, an FHA loan is currently 3.5% and a Conventional is 3% of the sales price. WHAT IF I DO NOT HAVE THE FUNDS FOR A DOWN PAYMENT? If you do not have the available funds there are still options. One is to receive a "gift" from a friend or family member to be used as the down payment. This money is "gifted" and does not have investment interest or ownership in the property. Click here to see a copy of a Gift Letter. Another is to check out First Time Buyer Down Payment Assistance Programs offed by the county, state or federal government. There are income, purchase price and some training course requirements that need to be met. Click here to see some of the available programs for First Time Buyers. AGENTS - Click Here for Info on the CalHFA Program for Listing Agents. And Here for a CalHFA Plus Summary Sheet. HOW CAN I INCREASE MY FICO SCORE? Since the FICO score is based on a history of credit and calculated on a formula, the only way to affect an upward score is to make timely payments on outstanding debt and to not incur additional debt, relative to your income. Overtime this may cause your FICO score to raise. This a very common question among Buyers, Sellers and even Realtors. Click HERE to see the answer. or read below. Entrance: A bedroom needs at least two methods of egress, so it should be accessible from the house (commonly through a door), and then have one other exit (window or door). Ceiling Height: A bedroom ceiling needs to be at least 7 ft tall. It’s okay if some portions of the ceiling are below this level, but at least 50% of the ceiling needs to be a minimum of 7 ft in height. Most ceilings tend to be at least 8 ft tall, so ceiling height is not usually an issue (R305.1). Escape: A bedroom must have one other method of egress beyond the entrance point. A door to the exterior works as an exit point, and so does a window. According to the International Residential Code, a bedroom window can be between 24 and 44 inches from the floor, it needs at least 5.7 square feet for the opening, and it must measure no less than 24 inches high and 20 inches wide (R310.1). Size: The room should be at least 70 sq ft, and more specifically the room cannot be smaller than 7 feet in any horizontal direction (sorry, that 1’x70′ room won’t work) (R304.2 / R304.4). As you can see, size, access, light, and ventilation all matter when it comes to defining a bedroom (IRC). There is one more issue we should talk about though. The closet. Are closets required? A bedroom should probably have a closet since most buyers expect one, but technically the International Residential Code does NOT mandate a bedroom to have a closet. So the lack of a closet does not necessarily mean a room cannot be a bedroom. However, we must ask, what does the local real estate market expect, and what is required by the local city/county? Would buyers consider a room as a bedroom if there is no closet? In newer tract subdivisions it’s probably a bigger deal to have no closet, but in older classic homes where bedrooms were sometimes not built with closets, it’s very likely not an issue at all. For instance, consider a Victorian home without closets in any bedrooms. While some in the real estate community say closets are always required, that rule doesn’t really apply here for two reasons: 1) The IRC definition of a bedroom does not actually mandate a closet; and 2) If the market considers the rooms as bedrooms, that’s what they are. It would be highly improbable for buyers to walk through an old Victorian home without closets and say, “The house was stunning and utterly perfect… but there weren’t any bedrooms”. Does that make sense? Ultimately closets are not technically mandated by the international definition, but they may be expected and/or required by local code. IF I OFFER ALL CASH, WHAT DISCOUNT SHOULD I EXPECT? A Buyer is free to present any offer to a seller and a seller is free to accept, deny or counter that offer on what ever terms that Seller want to make. Based on this, there is no "rule" that a Seller will accept a cash offer for less or for a discount - that is the decision only to be made by the Seller. Understand that from a Seller's perspective they are seeking to sell their property for the highest value and in most times in the shortest time, therefore a cash offer may be more interesting to a Seller since the Buyer would not be hindered by having to get a mortgage. This may encourage the Seller to accept a lower a sales price because they can close the deal faster. Again, the final decision on what to accept is the Seller's decision. The real estate agents can advise, but the final decision is the Sellers only. Once you have decided on a home to buy, you will work with your agent to "write the offer". There are several forms your agent will draft and that you will need complete that will describe the terms of your offer such as the price, the deposit, the down payment, your funding status, the expiration date, contingencies (items that need to be done/agreed to before your offer is valid), disclosures, etc. You need to review these terms and forms closely and it is even suggested that you have a legal professional review them to make sure your interests are fully protected. Your agent will also prepare an "Offer" package that represents you as the BEST candidates for the home for presentation to the Listing Broker/Agent who will present it to the seller for consideration. Click here for more information on what paperwork is required to make an offer. IF MY OFFER ISN'T ACCEPTED, IS THE DEAL OVER? If the Buyer makes an offer with an expiration date and the Seller does not accept or respond to that offer before the expiration date and time, the offer expires. Also, if the Seller does respond and offers a "counter" offer, this means the Seller has denied the Buyer's offer so the Buyer's offer is then void. For additional information, please seek legal representation based on your specific case. IS A HOME INSPECTION NEEDED? WHO PAYS FOR IT? No, you are not required to have any home inspected, but with such a large investment, it is always wise to protect your potential investment and know what you are buying with the help of an expert in home construction. If you find items that require attention you can then discuss with the Seller and either come to terms that are acceptable to both, or you may cancel the offer, if done within the terms of your offer agreement. Who pays for the inspection is negotiable but usually the Buyer pays for the home inspections. NOTE: some sellers will have the home inspected before they list it, repair the issues or adjust the price and then disclose this in the sales information. In this case it is the buyers option to use that inspection or have their own inspection done. Click Here to find a California Real Estate Inspection Association member in your area, or ask your On Demand Realty agent for a local referral. IS A PEST INSPECTION REQUIRED? WHAT IS COVERED? A residential pest inspection is not required in the sale/purchase of a home unless the lender requires it, but it is advised that all Buyers have such an inspection so they will be aware of the structural integrity of the building. Click Here to review the California Environmental Protection Agency - Pesticide Regulatory Department 2 page document describing the inspection process, findings and applications. WHAT IS AN ESCROW AND WHY IS IT IMPORTANT? WHAT ARE THE OPTIONS TO HOLD TITLE? The TITLE of home is the form of ownership and determines signature authority, legal, future rights and tax implications. For this reason, it is wise to understand your options when buying or owning a home as to the best form of ownership to use when recording your home. To assist with this, click here, "Common Ways to Hold Title" for a 2 page article created by Old Republic Title. If after reading this, you have have questions, it is advised you speak with your attorney and/or tax consultant for the best solution for you. When you are satisfied you have reached the best solution for you, then let your real estate agent know so the title company can properly prepare your papers for closing and recording. If you have already closed, you are still able to modify the title ownership and should consult with your attorney to make the necessary changes and have them recorded in the county where the home is located. WHAT IS A TITLE? TITLE INSURANCE? A Title is evidence that an owner is in lawful possession of the property and has the authority to transfer that ownership to another. Title Insurance is a policy that is assurance of indemnification for loss occasioned by defects in the title (ownership) to real property or to an interest therein which is insured. These terms relate to the legal ownership of the real property being defined and that the history has been properly checked but if there is an issue found at a later date, the insurance will cover the faults. WHAT IS THE DIFFERENCE BETWEEN "APPRAISED" VALUE AND "MARKET" VALUE? If you are going to finance your home, the lender will require that the home be "appraised". A certified appraiser will visit the home and check the sales of comparable homes in the local area to make sure that the home can support the value and protect the lender making the loan. The Appraised Value is based on historical sales values among similar homes and adjusted for differing amenities such as number of rooms, square footage, etc. The "Market Value" is what a buyer is willing to pay for the home in the open market. It is current, not historical, and can be higher or lower than the asking price based on the market conditions. There are times in a rising market when the Appraised (historical) Value will not meet the Market (current) Value. Since the lender wants to protect their investment they will use the Appraised Value and if it is less than the Market Value the Buyer may need to either pass on the sale or add more funds to the closing funds to cover the gap between the Market Value and the Appraised Value. 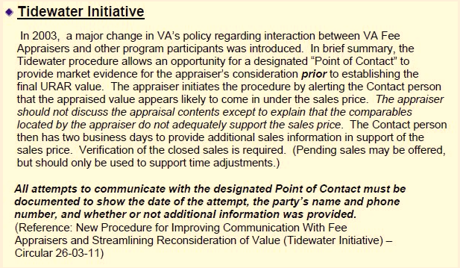 WHAT IS THE TIDEWATER INITIATIVE FOR VA APPRAISALS? Starting in 2003, a new initiative was introduced so that if the appraised valuation did not reach the valuation required, an opportunity was given within a set period of time for more information to be presented to see if the required valuation be supported. This is called the Tidewater Initiative. Below is a description. WHAT ARE CLOSING COSTS AND WHO PAYS THEM? Your closing costs will be determined on the sales price of the home, the amount of the down payment, pro-rated taxes, insurance, mortgage costs, legal costs, filing costs, etc. All of these costs are estimated and provided to you prior to the actual closing, as required by law, so you are fully informed on the costs of the transactions. In that disclosure you will also receive notification on who will pay for what expenses, how pro-rations will be handled at escrow and the amount of estimated you will need to bring to a closing, or will get from a closing. In other words, this answer is dependent on each specific sales transaction. Your agent should be able to help guide you in this process. WHAT ARE THE TRANSFER TAX RATES FOR MY CITY/COUNTY? Every time a property is sold, there is a fee for transferring the property. Click Here for the Transfer Tax Rates by County and City. This is part of the sales cost and used in the calculation of the Seller Net Proceeds. Who will pay the amount at closing can be negotiated in the Sales Agreement and where the rates are high, they can be shared among the Seller and Buyer. IF I AM SELF-EMPLOYED, CAN I STILL BUY A HOME? This is dependent on on your financial situation, the sales price of the home and the amount of funds available to you to complete the transaction. In general, if your credit is good, and you have income tax records for at least 2 years to support the mortgage amount required, the answer would be yes, maybe. Here is where it is very important to get Pre-Approved so that when you do find that right home you will be able to act on it and make an offer. IF I'VE FILED FOR BANKRUPTCY, CAN I STILL BUY A HOME? This is best determined in discussions with your lender, and your legal representatives, your current financial circumstances and the willingness of a lender to extend credit. Once you have gotten Pre-Approved, you can then being the search with an agent for your new home. PROPOSITION 13 - CAN I TRANSFER THE BASE YEAR VALUE OF MY CURRENT HOME TO MY NEW HOME? Proposition 13 was passed in California in 1978 to reduce and place limits on assessing property taxes. Click here, Howard Jarvis Taxpayers Association to lean more about Prop 13. Subsequent to the passage of Prop 13 were both Propositions 60 and 90 allowing seniors to transfer the base value of their home when they sell it and buy another. Prop 60 relates to intra-county transfers and Prop 90 relates to inter-county transfers among counties. Click here for more info on Prop 60 and Prop 90. To find out which counties participate in Proposition 90, click here for the CA Board of Equalization FAQ sheet. It is always recommended that you consult your accounting and legal professionals with regards to tax and legal questions concerning real estate issues. A Below-Market-Rate (BMR) unit is a unit that is priced to be affordable to households that are moderate income or below. Moderate income is defined as an annual income of 120% or less of the Area Median Income (AMI) for county, and varies depending on the number of people in the household. AMI is adjusted every year. Usually, the BMR price is lower than the prices of other units in the same development that are being sold on the open market. Sometimes BMR units are priced for and restricted to households that are low income (80% or less of AMI) or very low income (50% or less of AMI). For more information on BMR units, please give us a call. (Under development) a list of our local recommended Service Providers. Manufactured homes, also known by some as mobiles homes, offer a housing alternative to single family detached homes and condominiums/townhouses. Since these homes are usually found in "parks" that are privately owned, there is a different process for buying them, getting loans and the exchange of the sale as personal property or real property. To learn more, click here to visit information on Manufactured Homes. WHY USE ON DEMAND REALTY? OUR focus is YOUR satisfaction, always! Our founders and agents are all, first and foremost, Customer Focused. Some agents just want “the deal”, but we want you to be happy. As a result, we will be On Demand to your needs, your schedule, your questions and your satisfaction. Of course we share the same goal of finding the very best home for you, or the best price for the sale of your home, but in the end, your satisfaction is more important to On Demand Realty than “the deal”. With over 30+ years in business, we realize that the key to doing good business is treating people with respect, dignity, honesty and using candid communication. We also know that not all agents and all clients will work well together. If that ends up being the case, then we will strive to find another agent to meet your needs, or assist in transition to another brokerage. In the end, this is about YOU, not us, so we will make every effort to assure that you are satisfied. Enter your search term below to find valuable information within On Demand Realty website. Search for City Names, Schools, Prograns i.e. VA/FHA, Assistance programs, Blogs, etc. Click above to learn more about Contra Costa county and it's cities, or use the links below to get the latest listings. Click above link, Alameda County, to learn more about Alameda county and it's cities, or use the links below to get the latest listings.